Although I never directly met or talked to Srila Prabhupada, I did have the good fortune to attend a morning Bhagavad Gita class that he gave at the old Henry Street Temple in Brooklyn. I think that the year was 1972. 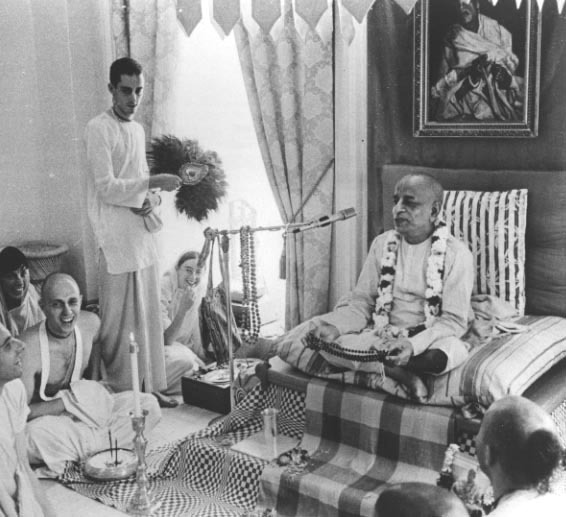 Srila Prabhupada mentioned that people in the San Francisco area were complaining about devotees going out on the streets and chanting and dancing -- practically calling them irresponsible for not working and what not. I'm paraphrasing this to the best of my ability, so please bear with me. Anyway, Prabhupada said that it could be understood by their comments that they were envious of the devotees (for being happy and carefree). "Don't envy us," he counseled: "Come and join us." You know, it's funny that if someone else had said such a seemingly simple thing as an inducement to join any other endeavor, I would have shrugged at its triteness. However, when His Divine Grace made that statement it seemed to have a very profound effect on me -- simply stated and amazing in its potency. I will remember that morning and the effect it had on me for the rest of my life.